This beautiful 10" round mirror is perfect for wedding table centerpieces and arts and crafts projects! Manufactured by Troy Systems, this glass mirror provides an incredible degree of clarity and an unsurpassed fabrication quality you have come to expect from the leading mirror fabricator in the industry. Since there are no frames, this mirror can match any decor in any room in your house. This 10 inch round mirror features a carefully crafted flat polished edge for a sleek look. 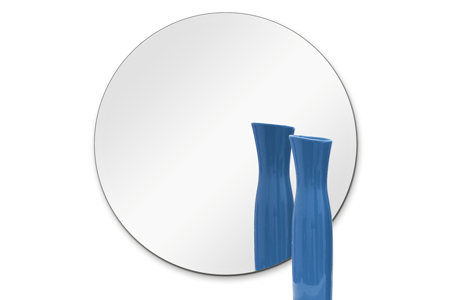 This mirror is 1/4" thick, which is the most popular thickness in home mirrors. Concerned about shipping? Don't be; unlike other online vendors, we specialize in glass and mirror products and over the years we have created most efficient methods in boxing and handling to minimize breakage during shipping. Furthermore, we guarantee that you will get your mirror intact.